“Just before Christmas 1957, me and several of my mates went into the Hercules pub in South Lambeth Road. A band was playing there called The Earthquakers, who were pretty good. I sat in with them and sang “Diana” and busked a couple of 12-bar rockers which seemed to go down well. Their manager came up and asked me if I would go to the Castle in Tooting, where they were playing next day, and sit in with them again. The line up was: Bob Stockwell (Guitar), Peter Chanter (Drums), Con Rich (Piano), Charlie Mitzi (Accordian) Les Hart (Tenor Sax) and Ray Pilgrim (vocals). 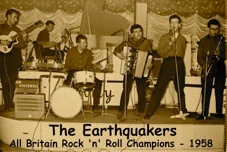 The Earthquakers quickly gained a large following, becoming very popular around South London and they soon became resident three nights a week at the Union Tavern, Camberwell. The landlord of the Union Tavern was Dave McCleave a well known boxer who had represented Great Britain in the 1932 Olympics and won Gold at the 1934 Empire Games before winning the UK professional Welterweight title in 1936. The Union Tavern had a large open area at the back which was used for boxing as well as for music (Here’s a LINK which shows Dave encouraging young kids to box at the Union, but it’s also the area where The Earthquakers played). With Ray as lead singer, their popularity rapidly grew, and the Union would get packed out on Earthquaker nights, bursting at the seams with literally hundreds of followers. And if ever the crowd got too rowdy (which on occasions they did) it was useful having a powerful boxer like Dave on hand to sort them out and calm them down! 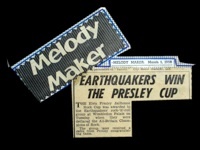 The Earthquakers then started to get bookings in more prestigious ballrooms such as Mecca’s Streatham Locarno. 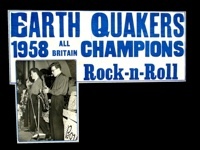 In early 1958, The Earthquakers, with Ray singing “Reet Petite”, won a big rock competition, gaining the grandiose title of “All Britain Rock ‘n’ Roll Champions”, narrowly beating Rory Blackwell and the Blackjacks to the prize of the Jailhouse Rock Cup and a congratulatory telegram from Elvis! Another part of the prize was some follow-on bookings at the Wimbledon Palais, resulting in Ray being asked to join the Oscar Rabin Orchestra, which he did in December 1958. 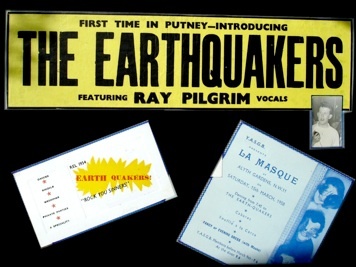 So in just under a year, Ray had gone from being an amateur trying to strum Skiffle and warble at the same time, to being featured vocalist broadcasting with one of the UK’s top well known Big Bands .... which was certainly due to the rapid experience he gained with The Earthquakers Rock ‘n’ Roll Band in the pubs of South London during 1958.